Made in the USA - Choose from Sizes: Aquabord 1/8" Flat, Aquabord 7/8" Panel, Aquabord 1.5" Panel, Museum Series Aquabord 2" Cradled. For studio and plein-air painting with standard framing. Museum Series Aquabord is available in a 1/8in flat panel for standard framing behind glass and in a 7/8in or 1.5in cradle profile for either frameless presentation or for use with floater frames. The 2in Deep Cradle eliminates the need for framing altogether. Stain, paint or wax the cradle edges and eliminate the cost of framing altogether! Seal and display without glass! Great for gouache, acrylic, and ink too! Acid-free textured clay surface that absorbs watercolors like a fine paper. Colors retain their purity and vibrancy in a way that even the finest of watercolor papers can never match. When compared with watercolor paper, this multimedia panel simulates the absorbency and texture of cold pressed, but allows color to be lifted back to white easily while also leaving the richest, most vibrant color possible. This workable surface provides natural looking highlights, fluid glazes, transparent subtle layers, and the ability to lift color while the surface is wet or even after it is dry. 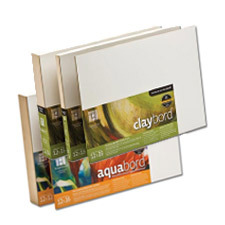 Uniquely absorbent Aquabord is perfect for watercolors and gouache, but is also ideal for casein and acrylics. Will not tear, shrink or buckle even under heavy water application. Archival, eco-friendly and made in the USA. Colors retain their purity and vibrancy in a way that even the finest of watercolor papers can't match. Absolutely Archival - Aquabord™ is an archival, acid-free textured clay surface that absorbs watercolors like a fine paper. Colors retain their purity and vibrancy in a way that even the finest of watercolor papers can never match! Made with conservator quality wood materials and sealing processes, no other panel on the market protects an artist’s work like an Ampersand panel. Brilliant Color and Unmatched Techniques - Get rich, luminous color and have complete control over your watercolors. Endlessly glaze and lift to underlying layers of color or completely lift back to white without damaging the surface! Watercolors and More - Uniquely absorbent Aquabord™ is perfect for watercolors and gouache. No stretching needed! Will not tear, shrink or buckle under heavy water applications. Also an ideal surface for casein, acrylics and more! Frame Without Glass - Watercolors can be sealed and displayed without glass keeping colors and textures true to life! Artist and Environment Friendly - Ampersand Aquabord™ is made from sustainable forest products that ensure the protection of wildlife, plants, soil and water. Always formaldehyde-free and no harmful volatile organic compounds. Get 3 for the price of 2 with our special bundle packs! *While supplies last. Comes 3 to a pack for the price of 2. Ampersand Museum Series Aquabord Panels is rated 4.8 out of 5 by 19. Rated 4 out of 5 by Steve H from Advantages and disadvantages compared to cold-press paper After painting watercolors on cold-pressed paper over a span of 50 years, I decided to try Aquabord. I'm just now far enough into my first painting on the surface to make any comparisons. I was drawn to it primarily due to the simplicity of presentation (no mat or glass) and the reduced cost and risk of shipping finished paintings to shows. I'm sure those advantages will be welcome, but pure watercolor shows usually won't accept the ground/presentation, so Aquabord will never entirely replace paper in my work.. As to the working properties, I'm finding it more difficult to achieve level colors than with CP paper. Edge quality of passages is much different than CP too - more like hot press. The vivid colors touted by Ampersand so far aren't impressive, but I suspect the final coating with Krylon that is required will enhance the colors. I love the durability of the surface and the ability to scrub passages back to almost pure white. I do a lot of glazing in my work, working quite wet and mixing on the ground, rather than in my palette. I can do all of that with Aquabord, but have had to modify my approach somewhat. Working wet is not at all the same as on paper - the drying properties are much different, plus there is the previously mentioned difference in edge quality. Glazing must be done with a very light hand and as little brush contact as possible to not wash out or blend previous passages. That property can be an advantage though, if the aim is to blend. I'm attaching a photo of my work-in-progress painting. You'll see that the sky in particular shows the difficulty I'm having achieving level colors. The shadow on the limb the owl is walking on shows a bit of the edge quality. On paper that would have been a much more gradual graded wash. The plumage of the owl shows the most effective handling of the medium on this ground, in my opinion. I took advantage of the ability to blend, particularly on the breast feathers. Rated 5 out of 5 by El Guapo from Usable in multiple ways Always was my favorite surface to paint on from day one when I tried the textured...I use it almost exclusively. If you're an acrylic painter like I am, it finishes up with a beautiful clean surface which just soaks up the color and is ready for the next glaze in no time. Getting harder to find the textured in art shops, but Jerry's has Ampersand textured whenever you need it. Great for watercolors, too! Rated 5 out of 5 by Mildly Addicted to the Aquabord from A great product at a good price. As a painting student, I love the quality and affordability of the Aquabords. The surface is sturdy and won't buckle or rip like watercolor paper can; I tend to be heavy handed when I draw and paint, and the Aquabord holds up to my rough treatment. The light texture of the surface holds the color well, and they end up being very rich and last a long time. Displaying the 1/8" is easy: just put it in a normal frame like any drawing or use a clip on frame. Also, I'm from a humid area, and the Aquabords hold up well in this environment. My only wish is that they came in unusual formats such as a landscape format or a circular format. Rated 5 out of 5 by Rahima from Great Product I paint detail work with gouache paints and this board really makes the paint stand out.It holds the color better than anything I have ever used. Rated 5 out of 5 by Anonymous from Wonderful alternative to canvas! Love using these boards and they sell well too! Not having to frame means more profits and easier for the individual purchasing the painting. I use the flat in order to allow freedom to frame or not to frame. I prefer museum width for my personal pieces however. Love these boards! Rated 5 out of 5 by Keiki from Excellent surface Being a watercolor artist who wanted to expand my repertoire, I tried this product. I found that the surface is eminently workable and color lifts beautifully. You can even completely remove the color and start with a clean board (depending on the permanence of the color), should you wish. The finished sealed product looks like an oil painting which is interesting to explain to viewers. One note is that when this board is scanned, you need to modify the finished image as it seems to come out more pale that the original. How do you seal these so you can display without glass? Seal finished watercolors or gouache with several light coats of spray varnish (or fixative), being careful to spray outdoors during warmer months or in a well ventilated and heated area during colder times of the year. We recommend Krylon UV Resistant Clear &ndash; Gloss, followed by Golden&rsquo;s Polymer Varnish with UVLS (in satin, or matte). Golden Artist Colors&rsquo; Polymer Varnish with UVLS offers additional protection against scratches during transport and also ultraviolet light. About 4 coats brushed-on, provides a very durable archival finish and is also removable for conservation purposes. https://ampersandart.com/faq.php#sealingwatercolors Please let us know if you have any other questions or concerns.